Discover 30% Off Selected Orders in the Clearance Sale at Lenovo Checkout the clearance now on at Lenovo where you can save up to 30%! Up to 30% Off ThinkPad P1 at Lenovo Enjoy the portability of a laptop with the performance of a workstation when you purchase the Lenovo ThinkPad P1. Free Delivery Australia Wide at Lenovo At Lenovo, you can enjoy free Australia wide shipping! Up to 40% Off Selected Thinkpad PCs at Lenovo Get your fantastic Thinkpad PC for less with Lenovo today! E Series Laptops from $779 at Lenovo Discover innovative products at unbeatable prices with Lenovo today. Lenovo is a world renowned company for astounding computing technology that’s a cut above the competition. A $46bn name that has long enjoyed a place on the Fortune 500 list, it's a globally trusted brand in bringing you the latest innovations. One of Lenovo’s many strengths is its delivery of quality products for all levels. Its laptops come in ThinkPad grade for professionals, IdeaPad for the social user, Yoga for those on the go and Gaming models for truly adventurous players. The same is true for its desktop range, with its ThinkCentre for pros, IdeaCentre for entertainment and self-titled Lenovo range for first time users. Its highly versatile tablets have caused quite a stir with both Android and Windows models and its Convertibles that combine the functionality of a tablet and the power of a laptop. Powered by the very best Intel Processors, these come with high quality displays, plenty of storage and excellent battery life too. When you’ve got your device, you can even kit it out with accessories and a service plan. Lenovo has your tech life sorted! How do I use my Lenovo ecoupon? 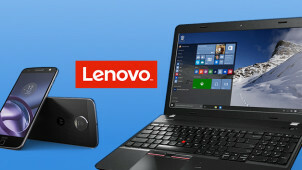 Check out the Lenovo deals page for some great offers on its stock! Can I get free delivery with Lenovo? Yes, all products are delivered free! What products does Lenovo recommend for students? Lenovo has an extensive student guide that’ll help you decide what’s right for you. Can I get replacement parts with Lenovo? Absolutely, you can search here by machine type, serial number or part number. How can I pay with Lenovo? You can pay with Visa, Mastercard, AmEx and PayPal. For online orders, you must return your purchase within 7 days of ordering to obtain a refund. A restocking fee of 20% will apply. Clearance products, peripherals, accessories, software, services and third party goods and services are not included. Contact Lenovo to initiate a return. Policy may vary for orders in store and over the phone. If you’re looking to upgrade your technology, there are few better places to go than Lenovo, one of the world’s most renowned tech companies. Whether you’re after a sleek laptop, versatile tablet or reliable desktop, Lenovo can get you the best for less and shopping with a Lenovo coupon from vouchercloud means you’ll save dollars on its already great deals. If you’re fed up with overpaying for underperforming computing products, make the switch to Lenovo for something better today! The development of the computer involves many different strands but one of the most important is the work of Alan Turing. His work developed the theory of the PC as we know it today, and he constructed the first detailed design for a ‘stored-program computer’ in 1946. He went on to work on the Manchester Mark 1, which would make some of these ideas a reality and his influence can be found in Lenovo’s products to this day! The Lenovo IdeaPad laptops provide a range of solutions to taking great computer power on the road. With models that offer all sorts of different specs and advantages, you’ll find something here that’ll work for you and shopping with one of our Lenovo discount codes from vouchercloud means you’ll save money too. Whether you’re playing games, watching movies or just staying connected, these IdeaPads give you everything you need. Happy laptopping!